The HydraFacial is a customizable, Glow & Go treatment for skin rejuvenation. This go-to revitalizing treatment safely treats the face, neck, chest, back and hands. It is an effective, non-invasive, exfoliating, cleaning, and skin rejuvenation treatment safe for all skin types. This is the most advanced patented vortex technology to address all skin concerns. It Is more effective yet gentler on your skin when compared to any Microdermabrasion or Silkpeel Dermal Infusion treatment. Your skin is pre-treated with gentle exfoliating solutions, damaged skin cells are gently removed, pores are cleaned and condition-specific formulations are delivered to the dermis. All treatments are customized to your skin’s needs to leave your skin irresistibly fresh! 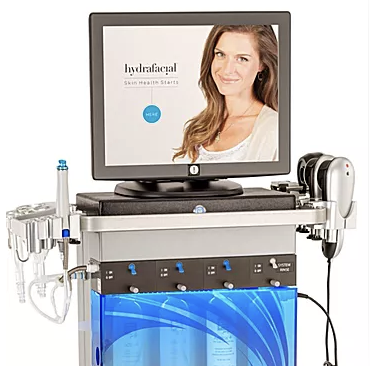 ThermoClear RF treatments may be added to further customize the HydraFacial to treat stubborn milia, oil bumps, sebaceous hyperplasia, cholesterol deposits and skin tags. Consultations are recommended to assess your skin prior to treatment, to ensure the HydraFacial is customized to your individual skin condition. SPF 50 sunscreen will be applied after your treatment. Treatments are not recommended for people with undiagnosed lesions, active rosacea or acne, weeping acne (stages 3 to 4), diabetes, auto-immune disorders, fragile capillaries, eczema, dermatitis, psoriasis or lupus. Treatments can be used as a stand-alone procedure or in combination with laser and RF-based treatments. Download pre and post treatment instructions for HydraFacial: here. Deeply cleanse, extract, and hydrate the skin through our super serums filled with antioxidants, peptides and hyaluronic acid.45 min Deluxe HydraFacialThese invigorating treatments include all of the essentials of the Signature HydraFacial while addressing specific skin concerns through HydraFacial’s boosters and protocols. Enjoy the benefits of this unique hybrid system with roller-flex technology. Gently removes impurities and the outermost layer of dead skin cells, while delivering vital antioxidants to refresh your eyes and lips. These treatments can be done alone or added to any HydraFacial treatment. This Eye Replenishing Serum awakens the delicate eye area with energizing green tea extract and citric acid, a natural skin brightener. PLUS, you get to take home the Eye Replenishing Serum to extend the treatment benefits coupled with a Soothing Eye Mask. For perfectly smooth, primed and hydrated lips with key ingredients of peppermint oil and peony extract to lightly plump your pout naturally. PLUS you get to take home the Lip Revitalizing Serum to extend the treatment benefits. Signature Hydrafacial – Deep cleansing, extractions and hydration.Skin Booster – One of the first four boosters listed above (additional $25 for ZO and Skin Ceuticals boosting treatments). LED Light Therapy – Further reduce the visible signs of aging. If you’d like to schedule a HydraFacial at Fresh Laser Skin Studio in NW Calgary, you can book an appointment online or you can give us a call at (403) 264-4494.